Mere minutes ago, a new Pope emerged from the conclave in Rome after Pope Benedict’s surprising resignation several weeks ago. The new Pope is the cardinal formerly-known as Jorge Mario Bergoglio. But now, he is Pope Francis. Now, I am fully and securely a Protestant, as most of the readers of this blog are. But for those of us that find ourselves in that Protestant tradition, we often forget a little detail of that name: Protestant. It means, literally, “the protesting ones”. We are “protest-ant” about many of the practices and teachings of the Catholic Church. But to “protest” something does not necessarily mean you are no longer a part of it. We are all, as the Creed says, part on “one holy catholic and apostolic church.” Part of maintaining that unity is seeing us as one family with disagreements, not different churches entirely. We did not “break off” from the Catholic Church. And so, in a sense, Pope Francis is my Pope, though I’m still in protest of the tradition of the Church he leads. In the end, I think I’m more okay with the Catholic view of Church authority than what contemporary Evangelicalism has had to offer. Just like how Protestants overreacted to priestly celibacy by imposing the unspoken principle that pastors seemingly must be married, Evangelicals seem to have overreacted to Catholic-ish forms of church government and authority by casting off authority in general (and no, saying “the Bible is my authority” is not the same thing; you’re still inevitably making yourself the “infallible” reader and applier of Scripture). I honestly think the whole “non-denominational” thing is far more dangerous than the papacy. I’ll take a Pope over a Mark Driscoll any day. 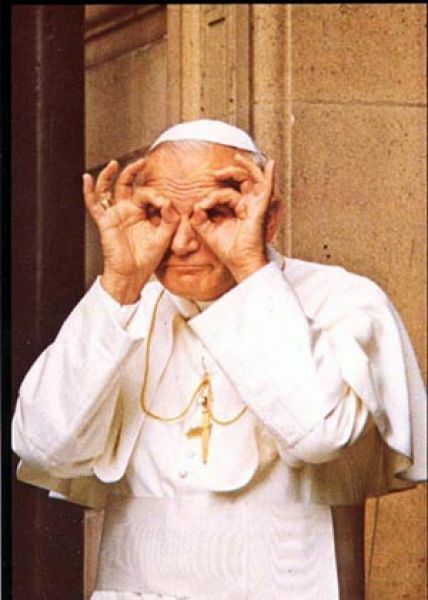 And honestly, I’m sort of okay with the idea of a Pope, though not as it’s exercised right now. In one article I read about the biblical basis for the papacy, the writer described the Pope as, in a sense, the “Prime Minister” of the Kingdom of God (where Jesus still is King). The Pope articulates and tries to put into practicalities the decrees of the King among his People. I’m okay with this, and I get the arguments for Peter’s “first Pope-ness” and the subsequent idea of papal succession. But even this “first Pope”–after his ordination to the top spot, mind you–denied Christ, ran away from Jerusalem and disappeared from the major work of the Acts church after persecution began, was called out for his racism by Paul, was martyred by the State (and was not in collusion with it), and may have even flirted with Gnosticism (depending on your thoughts on 2 Peter). He seems to have been the first among equals, who had been set aside for prominence, but not necessarily “authority”. Remember: the “first Pope” is the one that said that we are all a Kingdom of Priests. In short, I’d prefer a very human Pope. And so with that in mind, let us rejoice in God for our new Pope. Let’s pray for this next “weak man” in a long line of “weak men”. Even as we continue to Protest. You can also check out my on-going series “Catholics Aren’t Crazy” for more thoughts on Catholicism. Enjoyed reading this post and I like that term “Protesting Catholic.” And as is human nature, most Catholics are not 100% Catholic themselves. Excellent! Not enough Protestants are actually protesting. I also like that you see that saying “the Bible is my authority” essentially makes each individual their own pope. However, may I ask: what precisely are you still protesting? ha! i was going to ask this same question!!!! When saying the Apostle’s Creed every week, I actually say “The Holy Christian Church”. I have some serious theological issues with the Catholic church, and I don’t want to hypocritically proclaim to be a part of something that I’m don’t consider myself a part of. I was trying to write something about being a non-denominational Christian (because it’s what I consider myself) but it’s taking longer to put into words then I have right now. I’ll come back to it. There’s nothing left to protest. Come home to the church now! Leave theological chaos. Leave division. Follow the ORIGINAL teachings and traditions of the apostles. The church JESUS founded had a structure designed to prevent it from heresy, and to ensure unity. Follow the pattern of christ. COME HOME NOW.